I did my hippie thing this Sunday and rode my beach cruiser to the farmers market and crammed my hippie bike basket full of yummy finds. This week: heirloom tomatoes, Brussels sprouts, raspberries, pluots, green beans, grapefruit and (cue the angels singing) squash blossoms. How excited was I to find squash blossoms? Well…very. I’ve been dying to try this recipe from “Lunch in Paris” by Elizabeth Bard (a great beach read that tells a love story through food and ends each chapter with recipes). Her recipe calls for zucchini blossoms, but seeing how hard it was for me to find ANY edible blossoms, I subbed in my squash blossoms and it worked quite well. 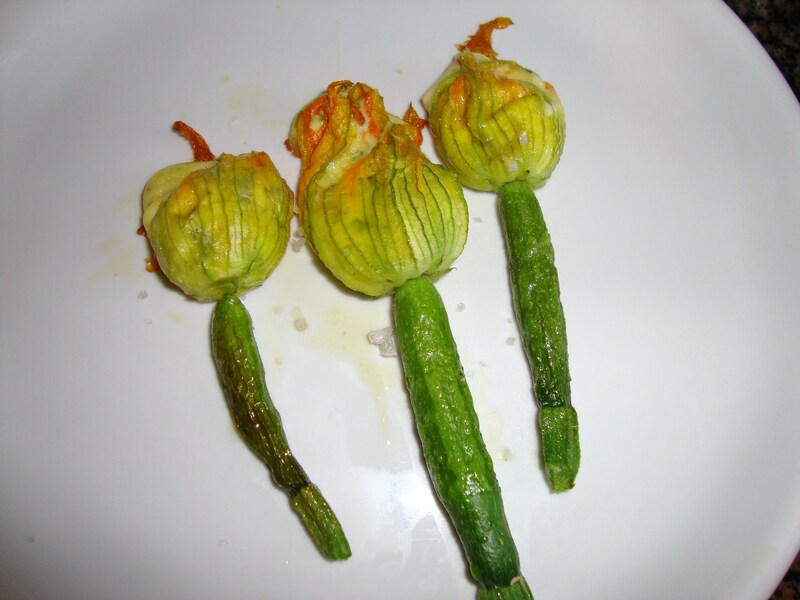 The recipe: Zucchini Flowers Stuffed with Goat Cheese and Mint. Warning: stuffing the delicate flowers definitely takes some patience so you don’t rip the flower open and ruin the great little pocket it has created for you. Careful! I’m not very patient, but I managed to not make too much of a mess of the process. After roasting in the oven, the end result, sprinkled with sea salt, was delish. I confess: I ate almost all of them. Preheat the oven to 350 F. Lightly beat the egg, crumble in the goat cheese, and mash them together with a fork. Add salt, pepper and mint. Stuff the flowers (no need to take out the stamen) with a small amount of the cheese mixture. Twist to close. Cover a baking sheet with aluminum foil. Pour a small amount of olive oil onto the sheet and spread it around with your fingers. 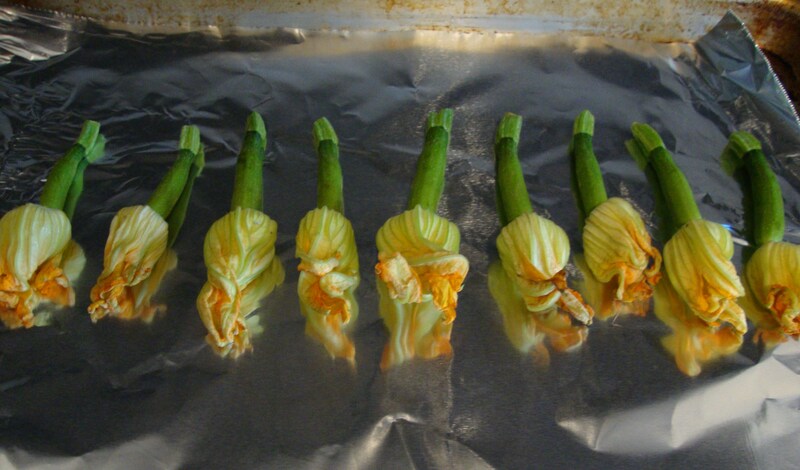 Roll the stuffed flowers through the oil until lightly coated. Bake for 12 to 15 minutes, until lightly browned and fragrant. This entry was posted in Recipes and tagged farmers market, goat cheese, squash blossoms, veggies by Tricia. Bookmark the permalink.